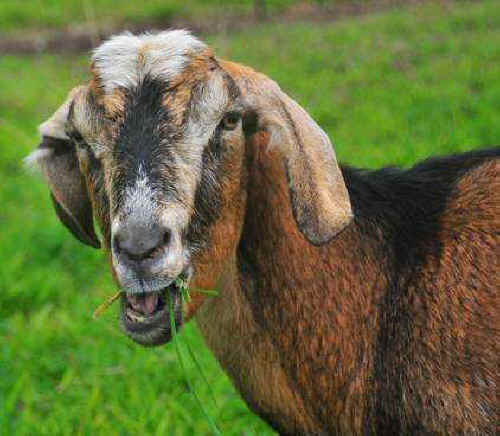 Johnny was born on a ranch with sixty other goats raised for meat. Because his mother wouldn’t nurse him, the rancher had to bottle feed him. Johnny was brought indoors several times a day for his bottle, and soon a bond formed between the rancher and the newborn goat. The rancher began to realize she couldn’t bear the thought of little Johnny being butchered someday, so she brought him to Leilani Farm Sanctuary. A week later, the rancher returned to the sanctuary to visit Johnny and brought her husband, a pig farmer. They stayed all afternoon, meeting all the rescued animals and learning about their stories. A followup call a month later revealed the farmers had a change of heart and decided to get out of the pig and goat meat business! !